After a pleasant day at the Woodward I found myself back on the road and heading to Norman, OK. The one issue with driving through Kansas is that there is precious little scenery. Adding to that issue is one must use the Kansas Turnpike which has to be one of the most mind-numbing drives one can take. I had to take the turnpike on a trip to Texas several years ago and I seem to recall wondering if the turnpike had been sponsored by Amoco and McDonald’s as those were the only places one would see at rest areas along the way. Well, some changes have been made in the ensuing years as Amoco seems to have been pushed out in favor of Valero and there was a Hardee’s or two to break up the McDonald’s. Sadly, that was the limit of the scenery for the drive. A day’s worth of driving brought me to Norman, OK where once again Mapquest had failed me utterly. From the pictures I had seen for my next inn, I suspected it was outside the city, but the directions planted me right in the middle of downtown Norman. Luckily, I found the Norman Public Library where Courtney graciously Googled Mapped better directions that took me to my next inn, the Whispering Pines Bed and Breakfast. Whispering Pines, owned and operated by Rany and Thavory Kchao, is rather secluded as it is located a bit out of town in the country. That seclusion was rather good for my writing sensibilities due to the peace and quiet. The property consists of the main house which holds several rooms and several luxury cottages located on various parts of the land. Whispering Pines is unusual as it lacks many of the features of interest that I would expect to find at B & Bs. 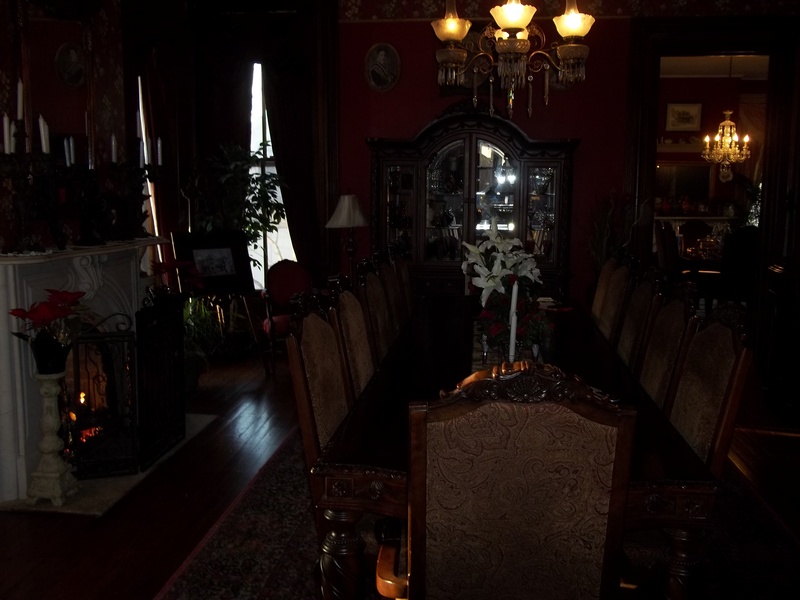 I’m rather fond of exploring the houses as I enjoy the various ornate rooms and history. Whispering Pines has more of the feel of a high class hotel as the lower floor consists of a check-in area and a dining room which serves as the location of Whispering Pines’ gourmet restaurant. After checking in, I was led to the English Hunt Room which was a very comfortable room. The centerpiece of the room was a luxurious king bed. 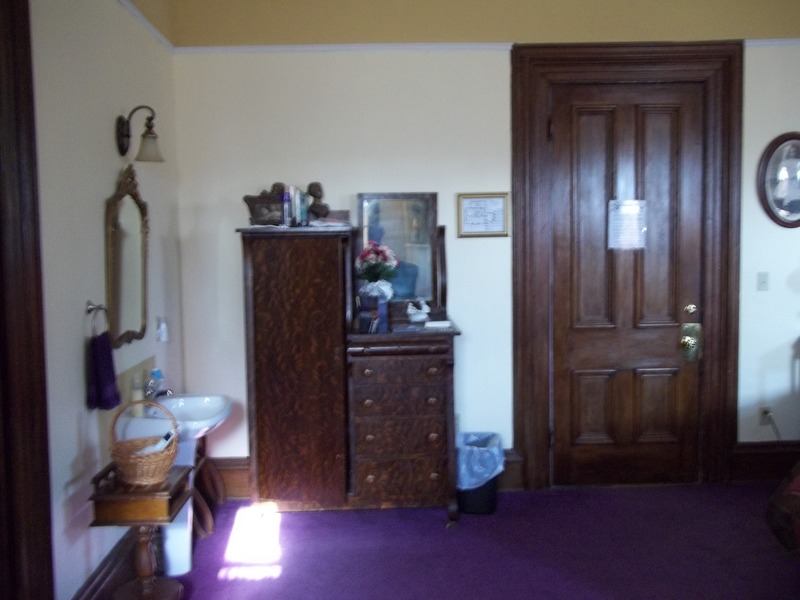 The room also has a small, but elegant bathroom with a Jacuzzi tub, and a private breakfast nook. What Whispering Pines lacks in terms of the traditional B & B experience, it more than makes up for in its magnificent perks. As I stated earlier, the inn’s dining room serves as the eating area for Whispering Pines’ gourmet restaurant. The reservations only restaurant is actually the primary focus of Whispering Pines as it is open to both guests and non-guests. If you find yourself in the area, make a reservation to eat here as the cuisine of French continental chefs, Chinda and Rany Kchao is a glorious experience. I was seated by the fireplace where I was brought a basket of freshly baked rolls which were served with a homemade butter which had honey and dill mixed into it. The taste was heavenly. My meal opened with a Hungarian mushroom soup with Hungarian paprika. The rich and thick orange broth had a lovely hint of spice and was deliciously creamy. Between the soup and main course I was served a lemon-lime sorbet which was a dandy little palate cleanser. For the main course I had an herb-potato encrusted salmon filet served with asparagus, zucchini, and scalloped potatoes. The chef also included a slightly toasted potato which was carved into the shape of a rosebud. It was both artful and tasty. The salmon was cooked perfectly and served with a splendid champagne cream sauce. The herb-potato added just the right bit of crunch and flavor. The vegetables were fresh and crispy and the scalloped potatoes were wonderful. After I finished the superb meal, I returned to my room where I enjoyed a nice long Jacuzzi bath. I then grabbed a soda from the complimentary treats cabinet on the first floor and sipped Coca-Cola while continuing my latest Nero Wolfe novel until I fell into slumber. 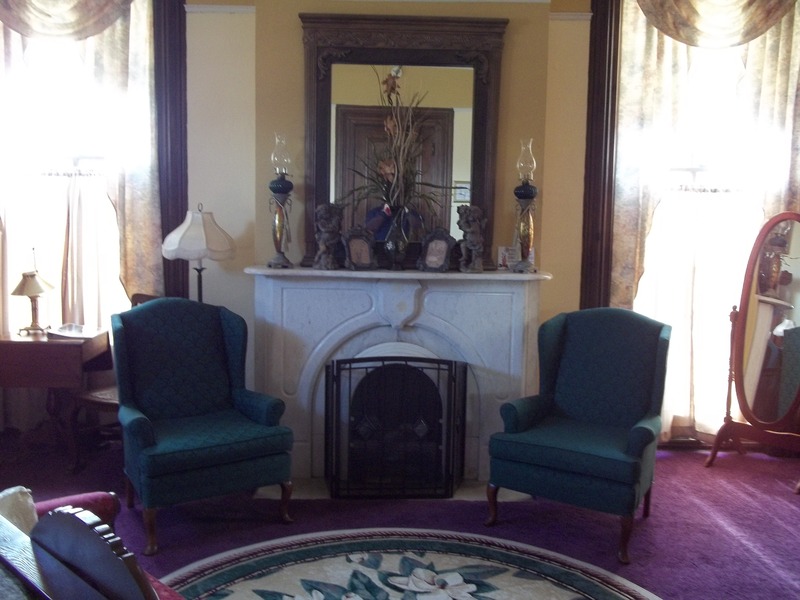 Another perk of the inn is that each room has a breakfast nook and breakfast is served directly to your room. A menu of choices is available in each room and you write your order down and place it in a box at the end of the first hallway with your preferred breakfast time. At 9am sharp, my breakfast was delivered. I had opted for a glass of orange juice with an omelet stuffed with cheese, onions, mushrooms, ham, and green peppers. On the side was a serving of fried potatoes, mixed fruit, and a toasted roll. Normally I like to provide a picture of the fine meals provided by B & Bs, but as I sit here and write, I have just realized that I enjoyed that fantastic repast without snapping a photo. But take my word, it was quite wonderful and it looked good, too. The fried potatoes had just the right blend of crunch, salt, and pepper. The omelet was a taster’s delight. The roll was made just so and the fruit was nice and fresh. Now I’m just going to pack and kill a little time before beginning the final leg of my journey to Arlington, TX. And, yes, I used Google Maps to refigure my route out of Norman. It was a gray and blustery day. I’m still in shock that I am able to tell you this story. The winter storm caught up to me with a seething ferocity. The snow blew so hard that it was nearly a complete whiteout. Then it happened. Some nut in a red Corvette came roaring by in the other lane like a bat out of heck. The unknown driver cut me off and clipped the front end of my car. My car careened off the road and rolled over 4 times. I have a vague realization of my seat belt coming loose and being thrown from my vehicle. I awoke in a hospital somewhere around Dows, IA. Both of my arms were broken and the nurse to whom I’m now dictating this story informed me that my gas line had ruptured and my car had exploded. Its burning carcass was seen through the snowy haze by motorists who summoned help and I was found thirty feet from the smoldering remains of my Focus. Wow! That’s a great start to a fiction story. But what really happened was that the drive was not too bad. Des Moines was the worst of it so I took things very slowly until I reached I-35. There wasn’t a lot of snow, but it was blowing around quite a bit due to the strong wind and would get whipped around pretty good when semi trucks drove by. I kept things well under the speed limit to be extra safe unless I was on completely clear stretches of road. I was aided by the fact that the roads were virtually empty and what few motorists were on the road also drove quite safely with one or two exceptions. Due to my safety measures, an extra 90 minutes were tacked onto my drive, but I wasn’t in a rush in the first place. About 2pm, I found myself in the Norwegian community of Decorah, IA. Thankfully, the owner of my next inn, Dug Road Inn, had given me a call to check to see if I were still coming and he let me check in an hour early due to the weather. 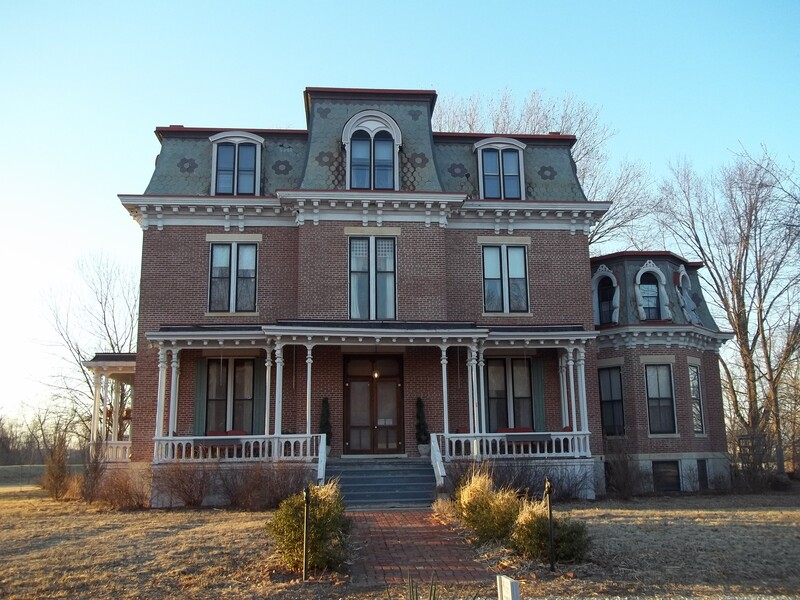 Dug Road Inn is an Italianate style home originally built by Lt Colonel William T Baker back in the 1860s. Its current owners are Doug and Shirleen Sturtz and the inn is touted as an eco-friendly B & B famed for its 3 course organic breakfasts. I was greeted in the driveway by Doug who helped me get my luggage into the house. He led me to the Duncan Room which would serve as my headquarters for the next 2 days. After getting my stuff settled, I returned to the living room where Doug brought me a glass of wine and we spent a little time conversing about my project and Iowa football. After our conversation, I returned to my room where I continued reading a new Nero Wolfe novel before the exhaustion of my long drive caused me to doze off for a brief nap. When I awoke, I glanced out the window and was met by a night and day difference. The storm had reached its peak and snow was falling steadily and the wind was howling. I really did not want to go outside, but I needed to eat. Luckily, the main drag was only 2 blocks away, so I donned my coat, hat, and gloves and headed outside. I decided not to press my luck and just eat at the first available place I could find. That would end up being the Old Armory BBQ which is one of the top 10 BBQ restaurants in Iowa. When I entered the place, it seemed as if they were closing up and that fact was confirmed a few moments later by one of the employees. They still had some food left out and said they could prepare something for me. I settled for a hamburger with homemade pickles which was pretty good, though I couldn’t linger over it as I didn’t want to keep these people in here longer than necessary. I’m grateful that Old Armory kept me from going hungry that night so I left a good tip for the sandwich before trudging back to Dug Road Inn. I drew a hot bath after I returned to my room though the jets on the Jacuzzi tub didn’t seem to be working. But I enjoyed the bath as it was just the right temperature. Afterwards, I read myself to sleep with Rex Stout’s brilliant, if slothful, detective. The next morning, I met Doug’s wife, Shirleen, who had prepared my breakfast. The first course was a dish of mixed fruit (apples, grapes, and, I believe, pomegranate) in a dish of cream. The second course was baked bacon with a small salad of greens and tomatoes, scrambled eggs with mushrooms, and a wonderful food item that I could best describe as a stuffed pancake. The third course was a dessert course consisting of chocolate gelato and lefse. This meal I did do justice to as I blissfully enjoyed every bite. Regrettably, I had forgotten my camera upstairs so you’ll have to use your imaginations for this meal. I wanted some exercise so I got into my winter accessories and wandered around the downtown area to work off the meal. Downtown Decorah reminds me very much of my grandparents’ old hometown of Storm Lake, IA as it is mostly locally owned businesses. There is even a small J.C. Penney on one of the corners just like the one in Storm Lake. My meanderings brought me to GamesXP. If you’re a vintage video game connoisseur like I am, then this is the store for you. I was amazed by the classic games and systems this store had. Odyssey, Intellivision, Atari, Super Famicom, this place had it all. I was disappointed that I wasn’t able to continue building my Sega CD library as their selection was limited and didn’t have anything I wanted, but this is a store that I will surely visit again if my journeys bring me back. I returned to the inn where I found Doug scraping the ice from my vehicle, a personal touch of hospitality which I very much appreciated. I read a few more chapters before getting into my car and seeing what there was to see. I had hoped to visit the Ice Cave, but when I reached the road leading to it, I found it covered with snow. Remembering my misadventure back in Greenfield, I opted to turn back. However, I did find Dunnings’ Spring which has a 200 foot waterfall. I hiked up the steep hill through the new fallen snow and managed to grab some good pics of this natural beauty. Afterwards, I drove back to the inn where I read for a while and dried out my clothes. Around 4:30, I decided to take another hot bath to get the chill out of bones. After soaking for nearly an hour, I headed back downtown in search of supper. I ended up at Restauration in the famed Hotel Winneshiek. This is a small fine dining establishment that is well worth a visit. My meal began with a mixed green salad with a homemade ranch dressing with some homemade bread. The main course was an Iowa specialty, pork chop, with garlic mashed potatoes and vegetables (broccoli, carrots, and red onions). The salad was excellent, though I had hoped for hot bread. The presentation of the main course was superior, especially the grill marks on the Iowa chop which was, mmm, cooked to perfection. The vegetables were fresh and crisp, but the potatoes needed some more garlic. After the satisfying meal, I went back to Dug Road Inn and called it a night. I really didn’t want to get out of my comfortable bed the next morning, but the smell of fine cooking galvanized me to make the attempt. The Inn’s regular chef was able to make it in today and the meal once again began with mixed fruit (orange, grapes, pomegranate) with cream and granola. The main entrée was a tiny dish of cherry tomatoes in a dressing with Eggs Florentine cooked with parmesan cheese and spinach. Also included were fried potatoes with feta cheese, oregano, and chili powder and sausage. Each bite was heavenly. For dessert was apple-cranberry crisp with whipped cream that melted in my mouth. I was disappointed when my meal ended for I knew that my stay had come to a close. Dug Road Inn is certainly well worth a visit and Decorah is a fine little city, though probably best visited in the warmer months when there is more to see and do. If your travels brings you to Decorah, get a room at Dug Road Inn where you’ll enter as strangers and leave as friends. Believe it or not, dear readers, we have reached the 2nd anniversary of Chris’ Corner. 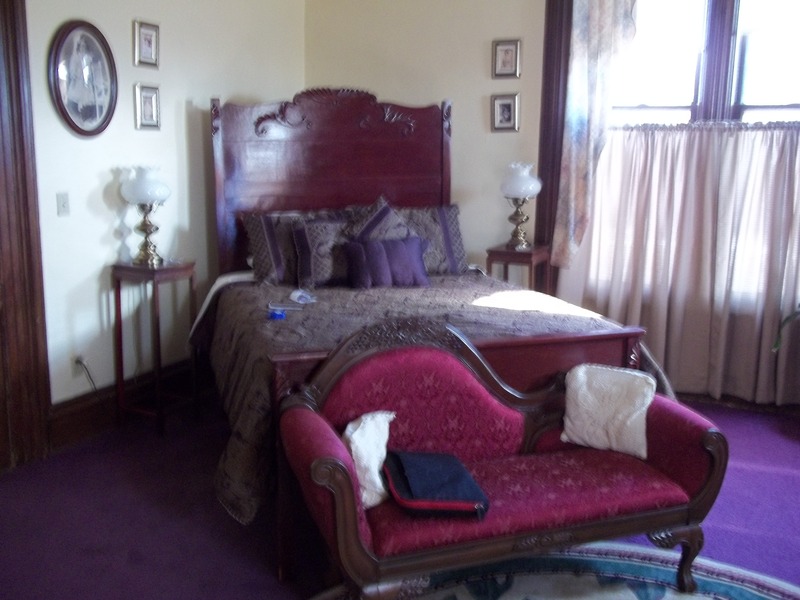 So, in celebration, I am bringing you along as I explore not one, but two, bed and breakfasts. 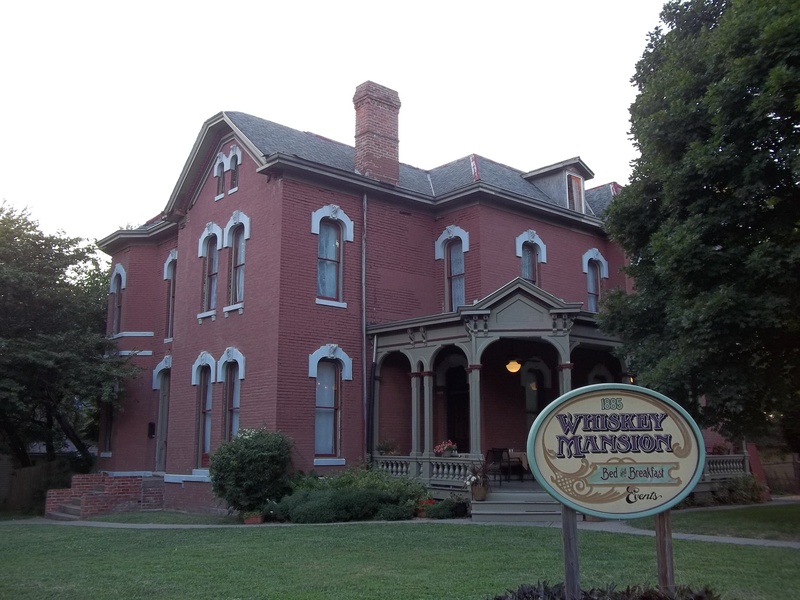 Ultimately, my road would be taking me to Springfield, MO, but I decided to have a brief stopover in St Joseph, MO where I would visit Whiskey Mansion. Unlike most of the towns I have visited to experience bed and breakfasts, St Joseph is actually a big town with a population of nearly 80,000 people. It self-describes as a sleepy river town, but don’t let that moniker fool you. It is actually quite a bustling town with a lot of things to see and do and was once a very wealthy town due to its reputation as a wholesale distribution center. My journey took me to the historic district of St Joseph. This area is a fixer-upper’s dream. There are quite a few mansions and old homes in the area, some in pristine condition and some which could use some fixing up. The area is known for two hills: Mansion Hill and Cathedral Hill. Yes, the names are self-explanatory. Mansion Hill is famous for mansions and Cathedral Hill is notable for its numerous churches. A few moments later I met Mark who was taking care of Whiskey Mansion for the owner that weekend. He gave me a brief tour of the home and led me to the Tower Room which would serve as my abode for the night. The Tower Room is a bit of a misnomer as it is actually on the second floor of the house. 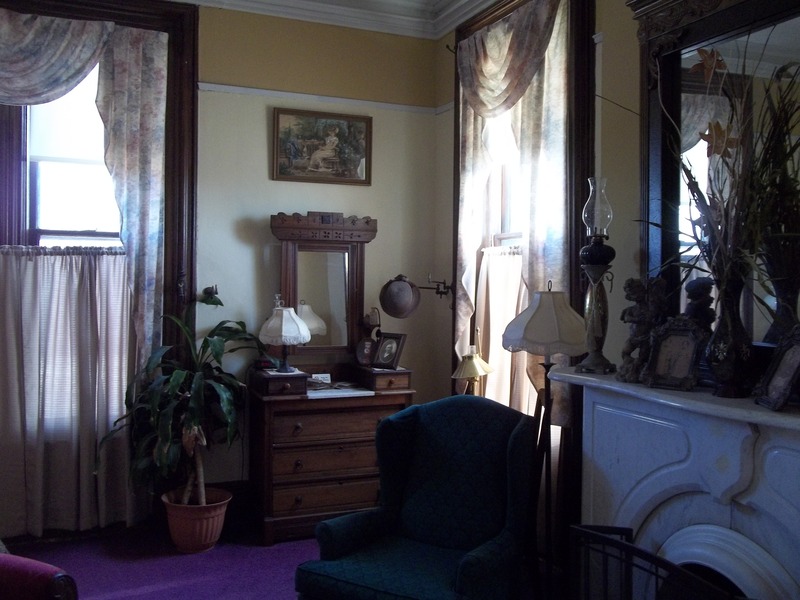 It is a very quaint and cozy room, dominated by a queen bed and a sitting area by two bay windows. After settling in, I began my explorations of the house. The interesting thing about Whiskey Mansion is that it feels like a very old house as opposed to an inn. As Mark said, it is not a museum, so people are welcome to go wherever they like in the house. This gives it a very quaint, lived in quality. Mark showed me a pictorial history of Whiskey Mansion and the house had been gutted by arson in the mid 1990s. The fire destroyed the third floor of the house and smoke damaged the rest. It was at this point that the current owner bought the place and he slowly restored the mansion to its current state. A picture of Whiskey Mansion after the fire that destroyed it in the mid 1990s. Under Mark’s suggestion, I visited Boudreaux’s Louisiana Seafood for dinner. I definitely recommend this eatery, if you find yourself in St Joseph. The restaurant is in the bottom floor of a warehouse on Robidoux Row and this was some of the best Cajun cuisine I had ever tasted. I began with a cup of shrimp gumbo which I thought was a bit overpriced at $5.99, but it tasted so good, I felt it was worth the cost. The spicy brown broth was absolutely delicious and the shrimp were anything but small as each was nearly the length of my pinkie finger. Throw a little rice into the soup and you have a tasty dish. For the main entrée, I had a chicken Po’Boy half sandwich with a side of Cajun mashed potatoes. The sandwich was perfect. Everything from the crunch of the lightly toasted baguette, to the slightly blackened chicken, to the tasty cheese, and tantalizing special sauce was a delight to my tongue. And the potatoes were the best I have ever eaten. Zesty and fluffy. If you eat anything at this restaurant, try this. With my stomach full, I returned to the inn to do a little work before crawling under the thick blankets and resting my head on the feather pillows for a good night’s sleep. Upon awaking the next morning, I was ready for a good meal. It was a beautiful day so I decided to enjoy breakfast out on the patio. Let me assure you that the breakfast at Whiskey Mansion is not one to be missed. The food was worth the stay by itself. Mark started me off with a small dish of mixed fruit (grapes, strawberries, and banana) served with a goblet of water and a glass of orange juice. That was followed with two slices of fresh baked cranberry bread. It was amazing! I haven’t had fresh baked bread since I was a kid and a lot of fond memories were awakened with the smell of warm bread wafting in the air. The bread was lightly drizzled with honey, butter, and I thought I detected a whiff of cinnamon. Mark told me that the owner bakes three different kinds of bread, so it would be worth coming back just to sample the other varieties. Some mixed fruit, water, and OJ to start the day. Mmmmm!!! Fresh baked cranberry bread with honey. The main course was a sensational cheese quiche. I slowly indulged my taste buds as I read through The League of Frightened Men by Rex Stout, a tale of the great armchair detective, Nero Wolfe (who also happens to be a gourmet and gourmand). After breakfast, Mark gave me a tour of the unoccupied guest rooms and I returned to my room to finish my article and continue to Springfield. 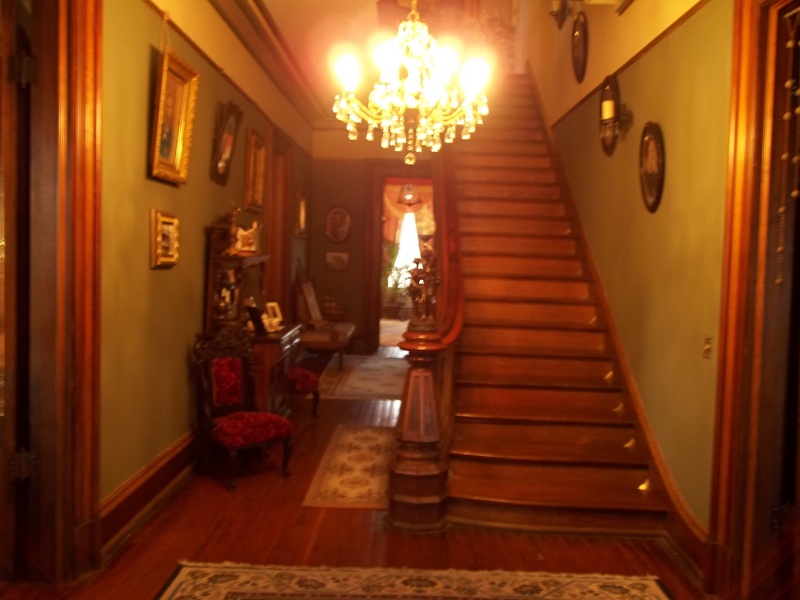 Whiskey Mansion is worthy of a visit if you find yourself in St Joseph, MO. You’ll find clean and comfortable rooms in a house filled with character and you will enjoy one of the finest breakfasts you can imagine.